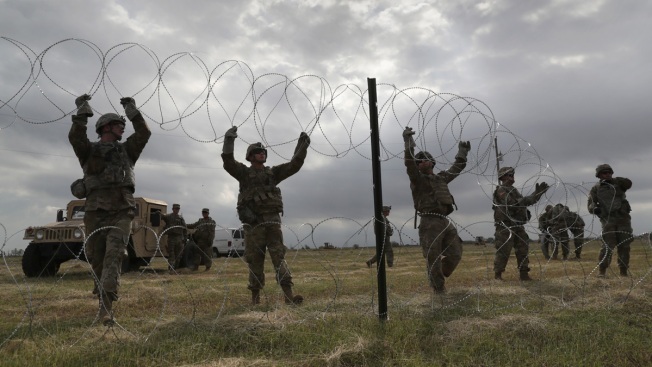 In this Nov. 4, 2018, file photo, U.S. Army soldiers from Ft. Riley, Kansas string razor wire near the port of entry at the U.S.-Mexico border in Donna, Texas. When some of President Donald Trump's top national security advisers gathered at the White House Tuesday night to talk about the surge of immigrants across the southern border, they discussed increasing the U.S. military's involvement in the border mission, including whether the military could be used to build tent city detention camps for migrants, according to three U.S. officials familiar with the conversations. During the meeting, the officials also discussed whether the U.S. military could legally run the camps once the migrants are housed there, a move the three officials said was very unlikely since U.S. law prohibits the military from directly interacting with migrants. The law has been a major limitation for Trump, who wants to engage troops in his mission to get tougher on immigration. Acting Defense Secretary Patrick Shanahan was at the White House meeting Tuesday night and was open to sending more U.S. troops to support the border mission, so long as their assigned mission is within the law, according to the three U.S. officials. Thousands of troops are currently deployed along the southern border, and are mainly used for reinforcing existing fencing with barbed wire. Potential new projects for the troops that were mentioned Tuesday, according to the three officials — two from the Pentagon and one from Homeland Security — also included conducting assessments of the land before the construction of new tent cities in El Paso and Donna, Texas. They would also be used in assessments before construction of a new central processing center for migrants in El Paso, said the DHS official.